Skilled in combat, adept with a bow, but also well armoured where neccessary, the Mongol warrior knew the importance of good protection on the battlefield. Of course not every Mongol would be equipped with the best armour, but if they were blessed with it then they would have had some of the most effective armour of the time. The real nature of the Mongol warriors armour is a hard question to answer with confidence, little is truly known about the extend of heavy armour in the Mongol empire army. A common belief is that many Mongol warriors would simply have gone to battle wearing their everyday attire. This mean’t in effect their everyday clothing of a felt and fur hat, a deel, boots and a heavy fur or animal hide coat would have provided all their battle protection. It’s also thought that certain troops, prestigious or heavy armoured units would have had much more protection. Lamellar armour is thought to have been common, incorporating a helmet and shoulder pads. There are even example of Mongol horses wearing full lamellar armoured suits. Lamellar armour would be the first choice of a Mongol warrior, an early form of body armour that was comprised of multiple pieces or rectangular material laced together to form a carapace of sorts. Lamellar could be made from a multitude of materials from animal hide, leather or metal, and would have been time consuming to construct. The armour would have been manually and laboriously tied together, connecting all the small rectangles together to form this second skin of protection. Mongol warrior cavalry wearing lamellar armour. If a Mongol warrior had a helmet, then it would be made of iron or brass, and typically featured a neck guard to the side and rear created from a Lamellar style construction to move freely. It commonly thought that the Mongol warriors would line their helmets with fur, and some would even have a fur trim, or ear flaps extending from the side of the helmet, adding warmth and comfort. On top of the helmet would be a metal tip adorned with horse hair, adding a decorative element to the Mongol helmet. The Mongol warrior shield was one item that many Mongol warriors would have carried. Easy to manufacture compared to body armour the shield was just as effective in skilled hands and much lighter and easier to carry than a full suit of lamellar armour. The Mongol shield in the early empire days was built from wicker or willow, and was woven and bound into a circular and domed shield. The shield could be covered in animal hide, leather or just bare, and was small and easy to carry. 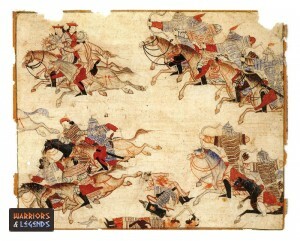 The Mongol warriors held the shield in a unique way, with two hand straps that would be pulled together to provide a good grip and control over the shield. This would mean the shield would be aligned with the front of the hand when clenched to a fist. Not every Mongol warrior would have access to full battle armour. Only the elite units and high rankings warriors would have been adorned with painstakingly constructed lamellar armour and helmets. If they were lucky enough it likely didn’t slow them down to much, on the back of a horse the additional weight of the armour was negligible, and the Mongols were so adept with their bow and arrow that no armour could dampen their skill and poise.